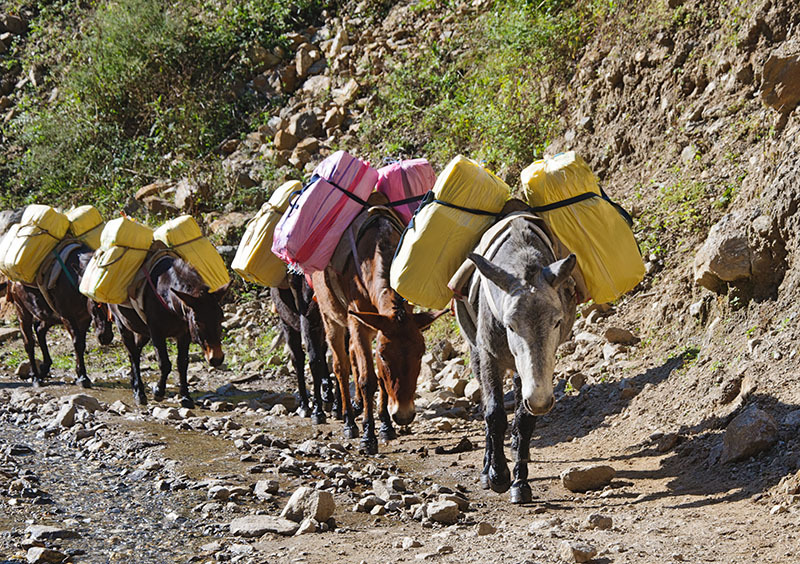 Pack Horse Operators charge a fee for carrying or packing supplies on horses or mules throughout remote areas for a third party. These third parties who contract pack horse operators could be resorts, park and government agencies, or outfitters for hunting and camping parties. This particular activity does not include anyone riding these animals, but several people ride horses that lead these pack horses that are carrying food, gear, documents, water, and other supplies that need to be delivered to campers, hunters, rescue teams, and trail riders. Sometimes pack horses are hired to haul discarded items out of the wilderness such as a downed aircraft, camping equipment of rescued hikers, and other things. With this responsibility, you need to have horse insurance for your particular business in case anything happens such as an injury. As a Pack Horse Operator, you may worry that you could be sued or otherwise have a claim made against you for bodily injury or property damage by a customer, or someone else who comes in contact with you, your pack animals, or the property that is part of your commercial horse operations. If sued, you will need to hire a lawyer to defend you and you wonder how you would go about doing this. If found negligent or responsible, you would likely have to pay for either a court-ordered or agreed-upon settlement to the injured party. Fortunately, much concern can be relieved when you buy a Commercial General Liability Policy [GL] to insure pack horse services. Commercial General Liability Insurance protects you from financial loss should someone become injured [Bodily Injury] or their property is damaged [Property Damage] in relation to your operations, and they make a claim or file a lawsuit against you for damages. How Risky is Pack Horse Services? Low to Moderate. The risk varies according to the trail conditions and human usage. If on a busy trail where people walk, the risk is greater than in a remote area where few ever go on foot. It also may vary according to the value of the property being carried. Horse activities are reasonably safe compared to many other activities people participate in. Yet, horse-human activities do carry inherent risks. Accidents do happen when people at different stages of capability attempt to touch, handle, train, ride, drive and control large animals that are unpredictable even when well trained. And some horse-human accidents are serious. Even with the best of intentions and management practices anyone can have a claim made against them and be sued. 1. Pack horses get loose and go off with gear and supplies being carried. They may cause damage or loss to property. 2. Pack horses on the move down a trail may injure a hiker or cyclist on the same trail. 3. A trespasser or visitor enters the area where horses or mules are waiting and are injured when trying to pet or handle them. Talk with one of our team members by calling 1-800-328-8894 to discuss your options for pack horse services. We work directly with you to decide which policy meets your exact needs and if we need to, we can tailor a policy to ensure you receive the horse insurance that is best for your business. We can also provide horse trainer insurance and horse mortality insurance.